Discover new trend in design – design wool felt. Are you fascinating by combination of beauty, quality and nature? Now it means even more – the style. In our household we want to have decorations, which will be not only stylish, but also practical. In everyday life we appreciate especially natural products, which will have positive effect on us and our family. From time to time (and sometimes more often) carpets or other things are getting dirty very easy. But what if your wool felt carpet or place mat could be waterproof and protective? Even healthy, because of the dust catching ability Besides that – funny, creative and good-looking! 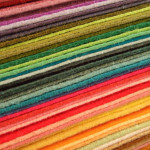 Design wool felt is made of quality MERINO sheep wool, which is softer than ordinary sheep wool. Comparing to the normal one, MERINO fibre is only a part of a wool diameter. This is also the reason, why is this wool soft like silk. Its fibres have also natural UV protection and fireproof ability. However, it has many other qualities, which made it so special and ideal for everyday using – it contains Lanolin, the natural protection against fluids, dirt, bacteries, microbe and smell. If you have problem to find in shops or internet the dream decoration you are searching for – you can easily create your own and start a business. With FELTWELT you can get self-designed personalised quality natural product, which will perfectly fit to your living room or kitchen. Together we will transform your original ideas into reality. Do not hesitate to contact us with your special requirements.